STXXL: Standard Template Library for Extra Large Data Sets. The core of STXXL is an implementation of the C++ standard template library STL for external memory (out-of-core) computations, i. e., STXXL implements containers and algorithms that can process huge volumes of data that only fit on disks. While the closeness to the STL supports ease of use and compatibility with existing applications, another design priority is high performance. Small constant factors in I/O volume. 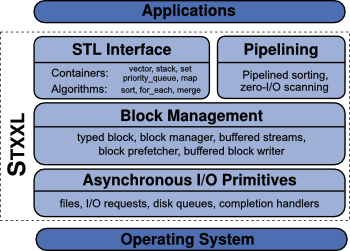 A unique library feature called "pipelining" can save more than half the number of I/Os, by streaming data between algorithmic components, instead of temporarily storing them on disk. A development branch supports asynchronous execution of the algorithmic components, enabling high-level task parallelism. For internal computation, parallel algorithms from the MCSTL or the libstdc++ parallel mode are optionally utilized, making the algorithms inherently benefit from multi-core parallelism. STXXL is free, open source, and available under the Boost Software License 1.0. Questions concerning use and development can be search for and asked on Stack Overflow, and longer user-contributed solutions may also be shared via the Github Wiki.. Discussions about future development and details of the STXXL should be posted to the sourceforge forums. Contains memory management, disk virtualization, prefetching, and so on, as the lower layers, and as part of the higher layer (pipelined) sorting with SMP and multi-core processor support, (pipelined) scanning and containers (vectors, stacks, priority queues, maps (B+Tree), queues, deques). Currently that sums to about 35,000 lines of code. See the current Changelog for detailed lists of changes. Special features are maintained as Github forks until they are merged into master. Until inclusion into the master branch, the interface may change without further notice. If you use STXXL and wish to appear in the following list, please provide a description line via email to one of the maintainers.